In 1871, in Paris, there was one of the first modern left-wing revolutions in the world. It came amidst a background of war and siege. 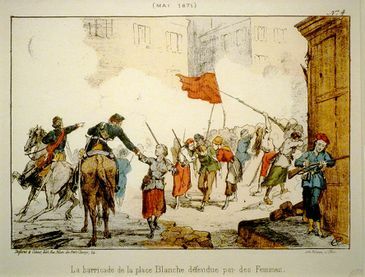 The Paris Commune as the revolution was known, sought to implement some of the most radical ideas of the French Revolution. The revolutionaries were much influenced by anarchism and were in many ways the precursors the Soviet Communist in Russian in the early 20th century. The Paris Commune was ultimately defeated, but it served as a model for many revolutionaries at the time and to the present day. In 1870, the Prussian Chancellor Bismarck engineered a war with France, under its Emperor Napoleon III. The two nations fought each other mainly in north-eastern France. The Prussians and their German allies defeated the French at the Battle of Sedan and captured the Emperor and they then proceeded to besiege Paris. In the city, the local defence was often in the hands of the the local militia, the National Guard and they were organised on the basis of neighbourhoods. At this time, many citizens of Paris, especially in the poorer neighbourhoods, effectively governed themselves, as they were cut off from the control of the central government, during the Prussian siege. A new provisional French government was located in Bordeaux, far in the South-West of France. Many of the members of the National Guard had left-wing sympathies and they had long resented the autocratic rule of Napoleon III and were eager for change. Many of the more radical elements in the National Guard were radicals and wanted a revolution. Many of these were sympathetic to the first Socialist movement the ‘First International’. 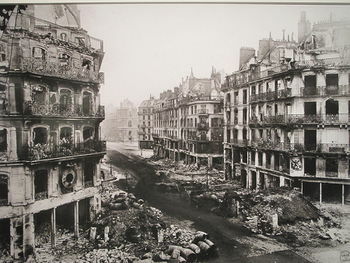 Many in Paris felt abandoned by the new French government and angry at their handling of the war effort. There was growing frustration with the French army and the government for failing to lift the Prussian siege and after a large demonstration, the National Guard seized control of the government of the city. They began to organise the government of the city on Socialist and Anarchist lines and were committed to the defence of Paris against the besieging Germans. The Communards as they became known, organised an election, which they won. They organised the city on socialist principles and power was located with local committees. The rebels demanded a separation of Church and State, universal suffrage and some, demanded even the abolition of all private property. They also wanted the power to rest with the people and their local committees. The rebels saw themselves as the heirs of the Great French Revolutionaries such as Marat and Danton. The Communards as they became known, defied the new French government and sought to extend their rule throughout France. After the French government agreed to a peace treaty with the Germans, the war between it and the Communards was inevitable. The new French government, under Adolphe Thiers, decided to crush the Communards and their movement. With secret German, help, who were still occupying territory around France, they despatched a large military force to Paris. When the Communards refused to hand over some cannon over to the French army, this was to provide the French army with the excuse it needed to crush the National Guard and all those who supported the Paris Commune. The French army bombarded the Communards in Paris and then attacked their strongholds. The rebels resisted furiously and the fighting became known as the ‘Bloody Week’. The French army brutally crushed the rebels and it summarily executed many Communards. The rebels had also committed many atrocities, including the execution of priests. At the end of the fighting, some 18,000 people had died and 25,000 were wounded. Many Communards were imprisoned and sent to Penal Colonies in French Guinea. The French Government was able to reassert its control over Paris. Soon after the Communards were crushed, the Prussians withdrew from France. The Communards were totally destroyed, however, their revolt and their ideology were to have an enormous influence. They were to inspire many revolutionaries from all over Europe. They saw in the Communard’s rebellion an example how a society could liberate itself from the forces of oppression, such as the Church and Monarchy. They saw the Communards as providing a model for a future and free society, where equality and justice were guaranteed. Nearly, every revolutionary movement in the period drew important lessons from the Parisian Revolutionaries. Their bloody suppression of the revolution persuaded many that change was only possible through violence. As a result, in the decades following the defeat of the Communards, many radical groups, engaged in terrorists’ attacks across Europe, but especially in the Russian Empire, where terrorist groups such as the People’s Will launched a campaign of bombings and assassinations. Almost immediately after the defeat of the Communards, left-wing radicals analysed why the revolution had failed. These critiques were very influential. None more so than that of Karl Marx, the founder of Communism. He studied the reasons for the failure of the revolt and published his findings in his work the Civil War in France (1871). He believed that the Commune failed because it was not ruthless enough and that if it should have been led by some professional revolutionaries. Marx believed that the Commune was the first example of the ‘dictatorship of the proletariat’, that is a form of participatory government, where all power was in the hands of ordinary people. The Communards and their revolution were to have a huge influence on Lenin. The Russian Revolutionary studied the works of Marx on the history of the Communards. He came to the conclusion that professional revolutionaries were needed to ensure that a revolution would succeed and not be quashed as were the Communards. 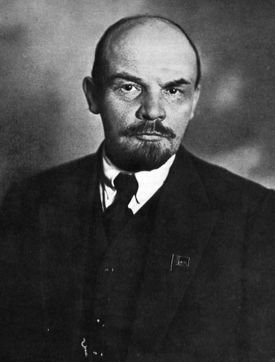 Lenin was also influenced by the organisation of the Communards and wrote extensively on their ideas and revolution. He modelled his Soviets or workers’ councils on the democratic councils established by the French Revolutionaries in 1871. The revolution of 1871 was to have an important influence on the Russian Revolution in 1917. The Paris Commune was a failed revolution. It attempted to fulfil the more radical ideas of the French Revolution in 1789. It was savagely repressed and there was to be no similar revolution in France until 1968. The repression of the Communards encouraged many left-wing groups to adopt more violent tactics and in the decades after the revolt, terrorism became a feature of European life. The ideas and the example of the Commune of 1871, were to have a decisive influence on both Marx and Lenin and continues to this day, in left-wing circles. How did Adolf Hitler become the Fuhrer of Germany? ↑ Edwards, Stewart. The Paris Commune 1871. (London: Eyre & Spottiswoode, 1971), p. 67. ↑ Cobban, Alfred, A History of Modern France (Hammondsworth, Penguin Books, 1965), p. 215. ↑ Merman, John (2014). Massacre: The Life and Death of the Paris Commune of 1871. (New Haven and London: Yale University Pres). p. 81. ↑ Butterworth, Alex. The World That Never Was: A True Story of Dreamers, Schemers, Anarchists and Secret Police (Pantheon Books, London, 2010), p. 4, 7, 14. ↑ Karl Marx, The Civil War in France, English Edition of 1871, p. 1. ↑ V.I. Lenin, "Lessons of the Commune", Marxists Internet Archive. Originally published: Zagranichnaya Gazeta, No. 2, 23 March 1908. Translated by Bernard Isaacs. This page was last edited on 15 April 2018, at 12:29.